A couple of years ago, I was a newbie trying to figure out how to "do" Noël in Paris. There was the Christmas tree question, the search for the nonexistent Saint-Sulpice holiday market and the dilemma about the bush ... oh, sorry, that's Bûche de Nöel. While it's still impossible for my lips to perform the necessary amount of puckering to pronounce the French words for Yule log, I've come to realize the importance of this holiday cake popularized by Parisian bakers in the 19th century. These desserts are such star attractions during holiday meals that chefs start considering the combination of flavors for next year's Bûche de Noël while the rest of us are still savoring this year's Yule log cake. At the beginning of November, I was invited to sample the Bûche de Noël as interpreted by Guy Martin's maisons: Le Grand Véfour, 68 Guy Martin and Atelier Guy Martin. Holding a plate with three, yes three (!!! 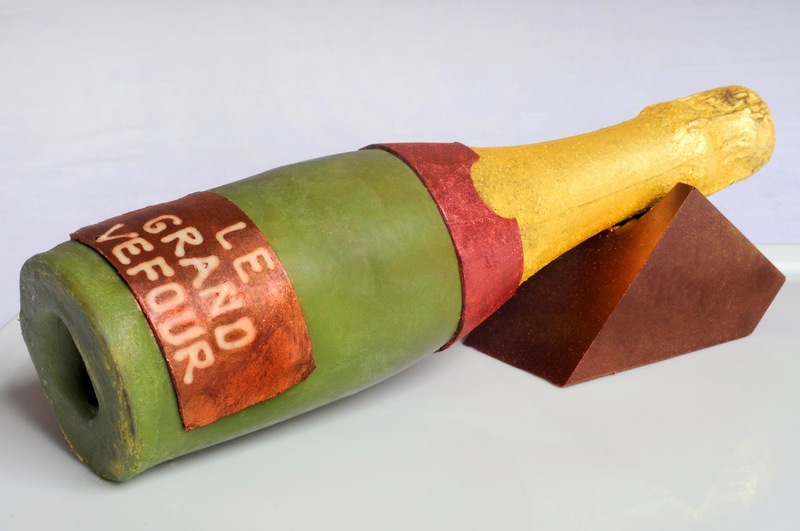 ), slices of cake, Michelin starred chef Guy Martin suggested that we start our tasting with Le Grand Vefour's festive bûche. In the shape of a chilled champagne bottle, the subtly fresh flavors of quince, mandarin and Japanese persimmon are enhanced by Ruinart Rosé. The result is a delicately flavored treat. If you would like to put one of these cakes on ice, be sure to order it at least five days in advance. It's available for two to six people. Of the three desserts, my favorite was the one inspired by a whiff of Shalimar perfume. With its lively notes of bergamot, lemon and mandarin, Le Restaurant 68 Guy Martin's Yule log cake is an invitation to travel to exotic lands. Trying to pin down a subtle flavor that wasn't mentioned in the tasting notes, I was pleased when Guy Martin confirmed that it was ________. No, I'm not going to tell you! As M. Martin said, a good chef never reveals all of his secrets. Put your taste buds to the test. 68 Guy Martin is a relaxing spot for afternoon tea and a slice of perfumed Yule log cake (6 euros). The restaurant is located in Guerlain's boutique at 68 avenue des Champs Élysées. Click here to read my recent review of lunch at 68 Guy Martin. Ruinart champagne, in my opinion, goes well with almost everything. 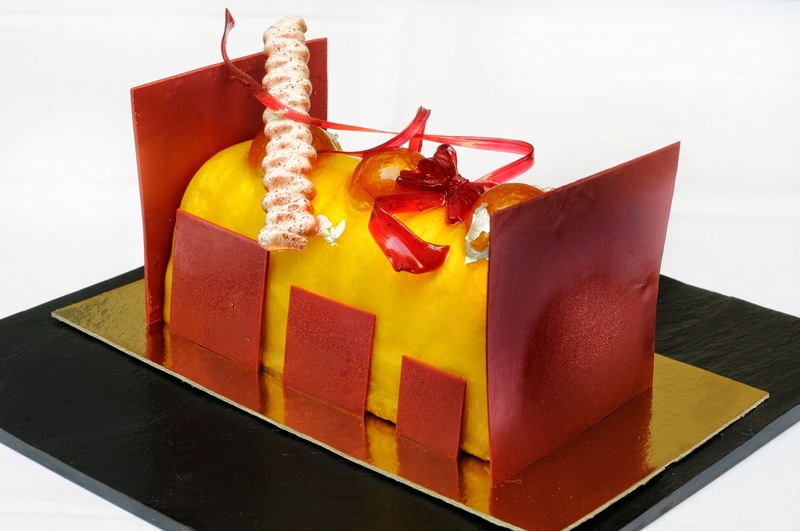 But, I think that the L'Atelier Guy Martin's "Savors of the Season" Yule log cake would have paired better with a cup of coffee than with the glass of bubbly I was sipping. The wintertime flavors of pear, citrus peel, spiced cookies, coffee and mascarpone conjures up memories from past Christmases. 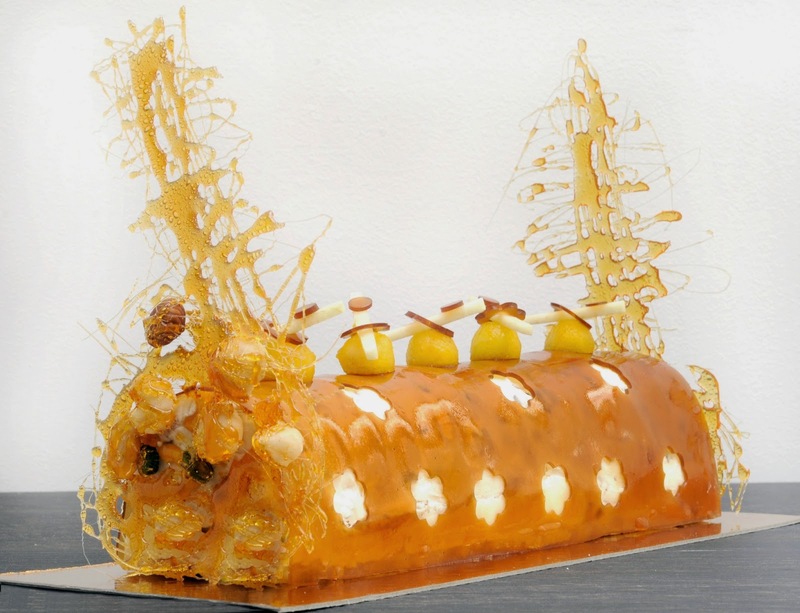 If you're feeling adventurous and would like to make your own Bûche de Noël, L'Atelier Guy Martin is offering courses for Yule log cakes on December 2, 6, 9 and 13. Please refer to the cooking school's website for additional details. Guy Martin (middle), Flavien Martin (far right) and the rest of the team.